There are numerous self-help books on everything from dieting to becoming a better person, parent, or friend, etc. 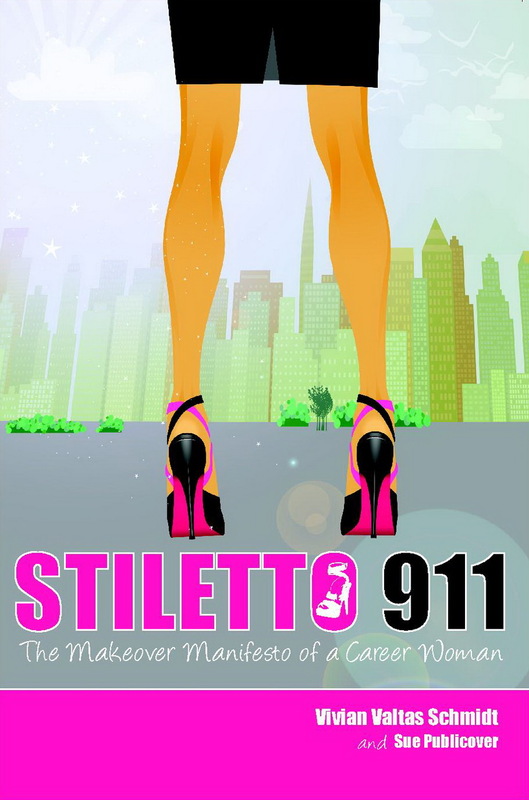 There are even books written about becoming more successful in what you may want to achieve, but I wager none of them are as a delightful as Stiletto 911: The Makeover Manifesto of a Career Woman by Vivian Valtas Schmidt and Sue Publicover. No, this makeover has nothing to do with cosmetics. This is the ultimate DIY makeover, a makeover of self. The authors provide great hints and cues for starting anew to achieve the goals you have set. These goals are provided in neat little footnote boxes accompanied by a shadowed stiletto shoe at the end of each chapter. The focal point of each chapter is the life and makeover of Morgan Demarest. Morgan is a 23-year-old that has been spoiled by life. She left her parents and moved in with her artist lover, Pavlo. Her parents provided for her every need and now Pavlo is doing the same thing by supplementing her income with his credit cards. Morgan is a woman that gets her fulfillment from retail therapy. She has a job but she still isn't sure what she wants to do with her life. Needless to say she is not so pleasantly surprised when she returns "home" one day to endure a rant from Pavlo because she is focusing more on her shopping finds than him. This becomes the turning point in Morgan's life, especially when her BFF is too busy with a new paramour to allow her to spend the night. She decides to turn to her father, only to find out that he has sold his apartment and moved out more than two months ago. As Morgan views and reviews her life and attempts to decide where to go, she ponders the question of what is she passionate about, what drives her. In this modern day pseudo-fairy tale, there is a fairy godmother, Divinity, to assist Morgan in her quest. Others that provide input and guidance include a mentor in the form of Elizabeth Tanner-Freitag, a small business owner, and a new love interest, Sam Baxter. The story doesn't exactly end with a happy ever after but a hopeful ever after, which is much better. The "footnotes" provide a spotlight on each chapter's message and provide the reader with questions to aid in a personal makeover quest. As I previously mentioned, I loved the idea of the chapter footnotes and highlights, such as don't dwell on the past but always learn from it or happiness doesn't come from others but from within . . . trite perhaps but very apropos. The authors have done an excellent job in providing guidelines for change and becoming a self-mentor in order to succeed. I wasn't quite sure what to expect from this book but I can say that I actually enjoyed reading it and appreciated the helpful hints throughout. Look for Stiletto 911: The Makeover Manifesto for a Career Woman on its release date of 09/18/2011. Until then you can check out www.stiletto911.com for tons of helpful thoughts and suggestions in starting work on the ultimate DIY makeover . . . you!